I am so excited to join Whitney from With Love from Texas in sharing my beliefs about education! I go back to school in a couple of weeks, and this was the perfect way for me to review the things that I believe in as a teacher. These are the things that matter to me. I tried to narrow it down, but I couldn’t do it! I love learning. And I want my kids to love learning. I want to foster that curiosity they naturally have and introduce them to new things to be curious about. I know that learning doesn’t happen without me knowing my kids and building relationships with them. I know that learning doesn’t happen without me making school fun and meaningful, and motivating my students to grow as people and push themselves. Learning doesn’t happen without my kids knowing that I value growth and effort over A+’s. Learning isn’t always staying on the lesson plan, and it’s definitely not keeping the same plans from year to year- because it’s ultimately about the kids. And learning doesn’t keep happen for my kids unless I keep learning, too! This summer I got a chance to go to a Picture-Perfect Science Workshop, an Indiana eLearning Technology conference, and a Scholastic Reading Summit. I chatted with teacher colleagues at the TeachersPayTeachers conference and hosted a Cincinnati teacher blogger meet-up. I blog to reflect on my learning, and creating for TpT pushes me to craft even better materials for my students. I participated in a Daily 5 book study, read Reading in the Wild, finally delved into the amazing world of professional development on Twitter, and bought lots of books to share with my kids, too! I hope you have done something this summer to keep learning too! And I'd like to encourage you to write down your educational beliefs somewhere- because it really does refocus you! If you’re looking for a little more back-to-school inspiration, check out more education beliefs from Michelle at From the Mixed-Up Files of Mrs. B! Thanks for stopping by Luckeyfrog Learning! As the Daily 5 book study wraps up, we’ll return to the core beliefs of the framework. I love that this chapter acknowledges the realities of a classroom- the substitute teachers, the kids who are always pushing our limits, parent volunteers, and new students- and shares insight for how to handle these situations without letting them ruin the good parts of the Daily 5! community, accountability, trust, and respect. And with most of our students, the steps outlined in setting up the Daily 5 allow these things to resonate and really take hold in our classrooms. A lot of PD books would stop here, but the Sisters are teachers. They GET that what works for 95% of our students the first go-around isn’t necessarily something that works for every kid without some extra support. Again, the Sisters’ response to a misbehaving child is not to assume they can do it and are being defiant, but to look at the why, and teach that child to succeed, adding support as needed. We can’t assume our students know how to meet expectations without teaching them, and we can’t expect that every student can meet those expectations without extra support. This is when we look at ourselves. Did we model? Did we engage the student when we should’ve let him or her be independent? Did we use positive voice and tone? Have we checked his or her book box for engaging, appropriate books, and helped the student choose new books if needed? Essentially- this is when we look at ourselves. WE are on a behavior plan, and we even ask colleagues to see if they notice anything WE can improve. If a student struggles, they need reteaching and practice. The Sisters suggest doing this during recess if needed to build accountability. By taking just 2-3 minutes and giving that child a specific goal to work on, it builds urgency- and being one-on-one with the teacher definitely puts the goal at the forefront of their minds. In the classroom, I would likely try this during the reading block when possible. I think staying in from recess feels too much like a punishment, and I don’t want that associated with our reading time at all. Instead, I can quietly confer with the student about a goal at the start of a reading round and then give them a few minutes of specific practice within the context of reading time. Of course, using a couple of minutes of recess could be an option if the student is just not taking it seriously, but I don’t think we should try it first. Just like with any instructional needs our students have, the next step after reteaching is to provide some modifications in class to help our barometer students be more successful. For this, consider how your student struggles. Having a hard time sitting in one spot? Give them a defined space or “office” to sit on. Having a hard time sitting still for so long? Add small brain breaks with kinesthetic tools in between reading. Essentially, look at what your student needs- and try to offer scaffolding towards that goal. For my barometer student, L, a couple of years ago, he struggled a lot with staying in one spot and focusing. I let him choose what he felt like he needed to work on the most, and he chose focusing on his book. I asked him what might help, and he asked if he could sit by a responsible student who could give him a silent reminder if he was off-task. She was very patient, and he wanted to do well- so it worked for him! I also contacted his parents to let them know we were working on stamina, and suggested they spend a little time building reading stamina and even stamina to sit still during other activities at home. He began to see success, and as his confidence grew, I saw his independence grow, too! At a professional development session I attended last week, I heard a sentence I just loved: “Scaffolding is meant to come down.” If we continue to provide the same supports that a student initially needs without ever reconsidering their needs, that student may come to depend on the supports forever. If our goal is truly to build independence, we need to slowly remove the modifications that helped our student succeed. The Sisters suggest sandwiching quick check-ins within a round. I found that sometimes, this gradual release happened naturally- and all I had to do was check in with students. With my student L, his friend stopped needing to give him so many reminders, and one day he asked me if he could go sit by someone else. I turned it back to him and asked what he thought. He was pretty sure he could do it- and so I encouraged him to go for it and told him we’d check in again at the end of the round. Guess what? He rocked it. I really think that giving him ownership over the modifications was a big part in his success. At the end of the year, his mom asked me for a conference. The year prior, he had been a “behavior problem.” This year, though, L loved school- and even though he still struggled to focus at times, his behavior had improved immensely. At our conference, his mom wanted to know what had helped, and what she could do to continue his success- and I begged her to please keep him reading for a round or two every day of the summer. For him, learning to be independent went beyond just reading independently- building stamina and taking responsibility for his choices and success were paramount in his improvement. Ultimately, I think a lot of why he had been in so much trouble the year before was that his teacher didn’t think he could do it- but the Daily 5’s core beliefs made a difference. And for this eager-to-please boy, knowing that I trusted he COULD do it and WOULD do it (even if he needed a little help at first) made all the difference. The Sisters know that moving to this framework isn’t easy. They describe the initial discomfort to not having papers that prove your children’s learning (although my students’ reading notebooks helped with this for me). They understand the impatience you’ll feel when it takes days to launch and build stamina. They get that it’s hard for us to try something new and not feel like it’s running perfectly right at the start. Trust our students and our teaching, and read research to allow the experts in our field to give us courage. They also provide tips in this last chapter for working with parents (who may be skeptical of something so different), introducing the system to new students, and how to make sure everything runs smoothly even with a guest teacher. The appendices provided have everything you need to know to start the Daily 5- lesson plans to launch it, a stamina chart, the 10 Steps to Independence for each task, sample substitute plans, and even a sample parent letter. If you don’t have the book (or if you only had the first edition), it’s worth it. Ultimately, the Daily 5 in my classroom was a resounding success. Less busywork for me, less busywork for the students, and kids who went from hating reading to loving it. I can recall L finally making it to 20 minutes of stamina, and the look of pride on his face. I remember two of my students finding a contradiction about Abraham Lincoln’s life in two different texts, and hunkering down to do research for days to find the answer. I think back to the conversations I had with my students in their journals, and especially a girl who wrote to me about how she hates books where kids have a perfect life, because she doesn’t- and being able to recommend the perfect book to make her feel less alone. Reading is powerful- and the Daily 5 will get your kids really reading. And is there really anything more important than that? Chapter 1– What is the Daily 5, and How is the 2nd Edition Different? You can also read more about chapter 9 from Primary Inspired (the wonderful host of our book study!) and the other Daily 5 bloggers in the links below. Thanks for reading! Back-to-school time is always a little crazy, but a few of my upper elementary blogging friends have teamed up to share some of our back-to-school tips and tricks! I set up these Sterilite drawers at the end of each table, and they are a lifesaver! Everything my students need on a regular basis is in these drawers. Because they switch classes, it’s really helpful to have the glue, scissors, markers, and crayons here (rather than having them carry their own). The bottom drawer holds our science textbooks (the drawers struggle a little with that much weight, but we don’t actually get them out much), and the top drawer holds small whiteboards, dry erase markers, extra pencils and erasers, and sets of markers. Having the markers in individual “sets” made it so much easier to find text evidence in the passages from my Text Detectives (for 3rd grade and now 2nd) and Colorful Close Reads. This year, I’m keeping an eye out for travel soap containers so I can store my crayons in similar way. I love Crayola, but those boxes just do NOT hold up! Last year I used shower caddies instead of these smaller craft caddies. They held a little more, but they hung over the sides of the white drawers and sometimes my students would bump them… and of course, everything would fall all over the floor. My solution this year was smaller caddies and Velcro on the bottom. (I start with both Velcro dots on to make sure they will line up.) I’ll keep you posted how it works! My kids have science notebooks that stay in our classroom, and sometimes last year one was left behind. Despite sticker labels, it sometimes took a little time to figure out where it belonged- so this year, I’ll be using duct tape on the spines to help easily see where it goes. I can use the same color-code for almost everything in my classroom, too! I store my notebooks in these Dollar Tree bins. The same color of duct tape helps students identify the correct bin quickly, and once the school year gets started, I’ll write the homeroom on the frog, too. All of the bins sit on the floor under the whiteboard, in the order of when I see each class. Since my students come in and start their day with a Science QuickWrite, I have a couple of students pass out the notebooks at the start of class. As I dismiss groups at the end of class, each group can drop their notebooks in the bin on their way out. With 5 classes of science and 1 class of social studies, I occasionally struggled to keep up with make-up work. While my students were supposed to come pick up their work independently, it rarely happened- and then I spent time later trying to figure out what was missing. Putting these open folders up on the cabinet in the back of the room helped me so much! As my students get started on their QuickWrite, I take a moment to catch up with any students who have papers here- whether they are absent work, papers to re-do, or pages I kept aside for reteaching. Being a science teacher, I could spend so much time handing out materials. As much as possible, I try to keep common supplies at the supply stations and any special supplies (such as those for a lab) in a bin at the front of the room. I can simply call up one student from each group and most materials are ready within a minute! This also helps because I see my classes every other day. (Our kids go to reading and math every day, but during their third block, they alternate between science and social studies.) This means that I teach the same lesson for two days in a row- so being able to keep all materials in a bin makes for easy clean-up at the end of the day, too! While the “stuff” can be overwhelming when you see six classes, the paperwork can be even worse! The students each have a binder with tabs for each class, and my teacher binder has tabs for each of my classes, too. As soon as I have copies made, I keep my papers that I’ll need for teaching in the purple, blue, and green plastic drawers. (I love that they’re the 12x12 size so I can put one stack horizontally and then the next vertically!) I use the top black tray for the kids to turn in regular work, and the bottom tray for the kids to turn in anything late (make-up work, late work, redone work, etc.). I love having a central spot for any other supplies a kid might need (stapler, tape, hole punch, etc.) so they don’t have to ask me! There is so much to do this time of year- but hopefully these tips give you some classroom organization ideas! For more tips on starting the year off right, I hope you’ll check out the rest of the Back to School Survival Guide. 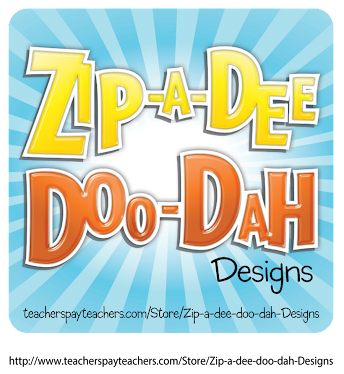 And to thank you for checking out our blog hop, we’re EACH giving away 2 gift cards to TeachersPayTeachers. If you could use $25 to spend on back to school goodies on TpT, be sure to enter the giveaway below. If you’d like a few more Back to School ideas (and more chances to win $25 gift cards! ), please be sure to check out some of the other blog posts. Good luck as you start another school year! The Daily 5 offers valuable independent activities to build my students’ literacy skills, so it’s natural that I wanted to extend the same kind of framework to math. After all, a format that strengthens foundational skills while I can reteach or run small groups should really be the goal across every subject! As you can see, the three main tasks (Math By Myself, Math Writing, and Math with Someone) have mini-lessons in between. This is new to the Daily 5 second edition, so I haven’t taught with this system yet- but I’m already brainstorming how I would! Where Math Daily 3 varies from Daily 5 is that the activities do not necessarily stay the same all year. Ideally, some of the activities students are doing are directly tied to the previous unit (especially as you start a new unit) or the current one (as you’ve taught some lessons that students should be ready to review). Because math activities may require hands-on materials or games, it’s best to introduce these activities one at a time and truly teach each one. Games and hands-on materials can very, very easily become playtime- so make sure you give students very clear expectations, and have ways to keep materials organized. As more choices for Math by Myself, Math with Someone, and Math Writing are introduced, you’ll want a way for students to easily see their choices. You can add to this choice board as you’ve introduced more activities. The key with Math Daily 3 is remembering to use the 10 Steps to Independence to really train your students in the expectations so that you are able to be differentiating instruction during this time. I think the key will be sitting down before each unit and brainstorming a few activities your kids can do to review the last unit and to practice skills for this unit, too. If this were my classroom, I’d probably use some routines (such as task cards and a math journal) that would be easy to swap out for each unit without having to teach new expectations. Feel free to click on the image above if you think this Daily 3 Math Planning Sheet is something you could use! As much work as it may seem to get set up with Daily 3, I think the value of small group instruction is WORTH it! And I think with routines and a few basic, adaptable activities, your students can be so independent while you work with a few. Welcome back to our Daily 5 book study! A big piece of the Daily 5 is to introduce the system slowly, and it starts with introducing Read to Self. After that, though, teachers need to know when to launch the next task, and that’s what chapter 7 is all about! One year, you may move on to the 2nd Daily 5 task in 3 or 4 days. With another class, it might be two weeks. What matters is not the specific timeline, but that you treat this like any other skillset to be learned. When YOUR class can demonstrate independence and stamina, they’re ready to move on- but the Sisters suggest different limits for different groups of kids. When I taught with the Daily 5, I waited to move on until my 3rd graders had about 15 minutes of stamina- but we continued to practice it until our graph reached 20 minutes. (We just alternated practicing Read to Self and Read to Someone.) Now, though, the Sisters suggest moving on to Work on Writing next. Basically, they say that writing is too important to wait any longer- and it’s also something that most students should have a little stamina in. Keep in mind, though, that Work on Writing is not replacing your writer’s workshop time! For those students who weren’t ready yet, I conferred, led small groups, or wrote responses back in their notebook to help guide them in the right direction. It just meant they needed more teaching- not that they couldn’t handle it! Once you start letting students choose which task they do, you need to give them a little accountability. The Sisters use check-ins for this. And while I can see the benefit of keeping an eye on where your kids are spending their time… I felt like I could usually keep an eye on this by watching my kids’ reading notebooks and glancing around the room. While they use check-ins to make sure an even number of kids go to Read to Someone, or to dismiss in smaller groups, I focused more on teaching my kids strategies for problem solving in those inevitable situations. I do like the idea of having students set a goal and a strategy they will use to reach their goal- something about voicing a goal helps you make it there!- but taking even a couple of minutes out of each round seemed too much. With older kids, I think setting the goal could be done at the beginning of the week in their notebooks. And please- if the idea of giving your kids choice is terrifying, read this post from a couple of years ago… it can work with accountability- and work SO well! I have so enjoyed revisiting the Daily 5 during this book study. I hope you are loving it as much as I am! You can see everyone linked up to this chapter at our host - Mrs. Price’s Kindergators- or check out the linky below! When friends have asked me about the differences between the first Daily 5 book and the second edition of Daily 5, one of the big ones for me is the detail to the foundation lessons and the lesson plans of the first few days. I feel like this edition is much easier to implement! Chapter 6 was all about the foundation lessons you teach to prepare your students for each Daily 5 task. By teaching these foundation lessons, you set your students up to be independent and successful… because it’s all about setting the expectations for your kids. When I read them this time, it hit me. These aren’t just foundations for Daily 5! These are foundations for a productive, independent classroom. Think about it- choosing a “successful spot” or choosing a good working partner lessons are really perfect for any time of day. I always try to empower my students with the responsibility of choosing a good spot when they come to sit at the carpet, or choose a partner in groups- because it asks my students to know themselves as learners and be aware of what works for them. This is important to me because we are NOT all the same. My mom is a get-it-done-early, sit-at-a-desk, focus-on-one-thing type person. When I work, I prefer to be on the couch with a favorite show (currently Gilmore Girls) on in the background, and usually, I’ve procrastinated- but then I keep tweaking it until it’s perfect! It’s just a different style. Some of my kids prefer to sit at a desk, where they can have their book on one side of the desk, their notebook on the other, and an easy surface on which to write. Other kids want to be curled up on a beanbag in the weirdest positions, with a book in the air and their fingers tapping and toes wiggling the whole time. In any case- it’s important for our kids to figure out what works for them so they can be independent readers and learners even when an adult is not telling them what to do. It also builds a culture of responsibility for our choices. I always talk with the kids about my own friends. I have some friends I just love, but I know I could not sit next to during an important staff meeting- because we’d be distracted, talking and giggling to each other the whole time. They seem a little shocked that I might ever “misbehave”- but I want them to understand that we are ALL human, and we ALL have to make choices that help us be successful. Ultimately, these foundation lessons are teaching our students decision-making strategies. I’ve always looked for ways to do this (one of my very first blog posts was about teaching students to use Rock, Paper, Scissors in the classroom! )- but Daily 5 does it in such a structured way. The foundation lessons also support my very first science lesson of the year- all about our brain, and how we should constantly be working to make our brain stronger. Teaching our students about growing in stamina and about how to work with a partner are so powerful because they give ownership over students’ own learning. I think my favorite is the “Coaching or Time?” lesson for Read to Someone. In it, students learn that they should give someone a few seconds to try a word before chiming in (or, as I tell them, “give your partner a chance to make their brain stronger”) and then offering two kinds of help. The student can choose if they would like coaching or more time to help them decode the word. These foundation lessons support my class through every subject, but they’re also vital to making sure my students are independently focused during Daily 5 so that I don’t have to stop my small group and individual instruction! These foundation lessons are especially important for Listen to Reading and Word Work because of the materials. The materials for Listen to Reading may be tricky to navigate at first- but teaching students how to use them but also how to get them out and put them away is huge. And in Word Work? These were what my students considered to be “fun” materials- so it was especially important to teach the expectations and practice them repeatedly. Of course, the specific, reading-based lessons are important… but my big takeaway from this chapter was just how much Daily 5 contributes to student success all day. If you want details on the foundation lessons taught, I’d definitely suggest getting the Daily 5 book! Starting the Daily 5 sounds a little daunting at first, but the second edition of the book really breaks it down even better than the first! I’ve really been enjoying our Daily 5 book study with Primary Inspired, and today I’m hosting Chapter 5- Launching Read to Self! Read to Self is probably my favorite part of Daily 5… and I was surprised to find that it was a favorite of most of my students, too. Teaching our kids to be independent readers is hard but powerful! A big key is to start small. In my head, I thought about how we teach any other part of reading. We don’t expect a kid to go from the ABC’s to knowing sounds to knowing decoding and being able to read- we take them through one step at a time. The same goes for building stamina. If you start small and build in increments, your kids will grow and get there. You just need to give it repetition and guided release. One way the second edition of Daily 5 was better than the first was the emphasis on foundation lessons. These 3 are really the building block lessons to set your students up for success in Read to Self- but remember,t he mini-lessons should only take 7-10 minutes! As a fourth grade teacher, my Upper Grade Skeptic light went off on this one- but the Sisters want us to remember that not every kid is necessarily reading on grade level, and yes- even those older kids need this! If your students don’t know how to choose appropriate books (and continue to receive guidance through the year if they struggle), they’re not going to sit somewhere and read independently! This lesson is so important to turning them from “survival” readers to lifelong readers! Can I just say an “Amen” to this wording? We need to be teaching our students in EVERY part of the day to make choices that allow them and their classmates to be successful- and asking them to take this on and then analyze whether it worked or not is so powerful. How many times a day do your kids have those decisions made for them? Ultimately, these and other foundation lessons are going to give your students the tools they need to do Read to Self and the other Daily 5 choices- because you’re not just expecting them to know what to do, but you are explicitly teaching, modeling, and allowing practice. And for me, I’m already thinking about how I can apply these ideas beyond the Daily 5 time. This summer, your goal as a teacher needs to be to think through your procedures first. Consider what you want to see- and where you think the pitfalls may be. Look at your schedule to see if you can plan in any regular brain breaks. (I highly recommend GoNoodle- it’s free!) Finally, keep your expectations low at the beginning, and plan for days and days of practice sessions. Don’t worry- they WILL get there, and once they’re ready, you won’t need to waste time correcting misbehavior as often. Take time now to make up time later! Finally, when you feel frustrated because it feels like your kids will NEVER get to 20 minutes of stamina, remember why it’s worth it. I loved the Sisters’ takeway from Gambrell’s work, saying that giving our students choice leads to ownership, and that leads to motivation, learning, and responsibility. Thanks for reading my thoughts on chapter 5! All teachers know that kids learn more when they’re excited and engaged. Today Matt from Digital: Divide & Conquer and I are hosting a team of bloggers to help your students take a BITE out of learning with a theme your students are sure to love! 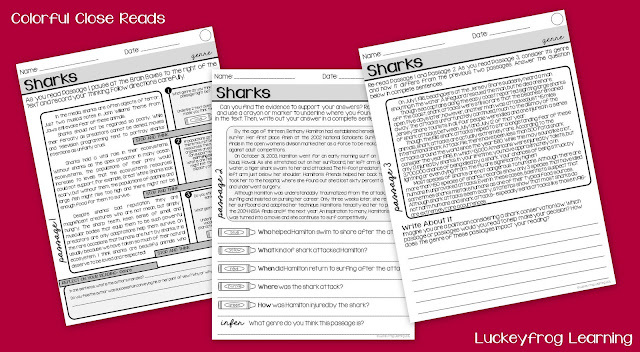 My Shark Week freebie is a few shark-themed passages for about grades 3-5. Together, the three passages guide students in analyzing genre, while still including some general annotations and reading comprehension, too! After reading the three passages, students complete a short written response that forces them to compare and contrast the passages. I am REALLY excited to try this out with my class- and I can't wait to hear what you think! Click on the photo below for Colorful Close Reads: Shark Attack! Genre Study. Be sure to go for a swim and visit Hilary at Rockin' Teacher Materials for the next free resource! When I first heard about the Daily 5, I have to admit I scoffed a little. Oh? Your kids just read for 20 minutes? Yeah, okay, but I know I’d have kids who wouldn’t be able to do that. Then I kept hearing the word stamina. Over and over again. And I realized, when I read the book, that the Sisters don’t expect kids to just be able to do it automatically. Instead, they teach it- just like we teach other skills and procedures- and then help the kids gradually build their stamina, from a couple of minutes up to many. 1. Identify what is to be taught. We do I Can statements in my school for this same reason. 2. Set a purpose and create a sense of urgency. If kids don’t see the point, they won’t be invested… just like us. 3. Record desired behaviors on an I-chart. We’ve all made charts with our kids, but the I-chart is especially powerful because kids see what the teacher will be doing, too. When the kids go from listening and looking at a chart to actually seeing them, and actually doing them, is powerful. 5. Model least-desirable behaviors, then most-desirable behaviors again. 6. Place students around the room. ”Is this a place where I and others can be successful?” is something that is so helpful not just in Daily 5, but all day. We have to teach our students to take responsibility for their choices and reflect on them. 7. Practice and build stamina. How do you get better at anything? You practice. And you give it time. 8. Stay out of the way. This is so hard. The hardest part of the Daily 5, I think. You have to let the kids practice without stepping in. You can’t circulate, you can’t give reminders, because you’re letting them learn to depend on you. Instead, we have to teach them to reflect and self-manage. And isn’t that what we all want? 9. Use a quiet signal to bring students back to the gathering place. Give them the chance to get up, move, and stretch a little- but don’t jar them out of their reading worlds. I secretly love seeing a kid trying to finish that one sentence or that one page before putting away their book box- because it’s a sign that they are into their book. Quietly, gently transitioning keeps the mood just right for focusing on a mini-lesson! 10. Conduct a group check-in. Again, we can’t always be the one telling the students whether they did well or poorly. We have to teach them to make that call for themselves and internalize their own power. That’s really what these steps to independence are- they’re training kids to believe their own power, and to build a growth mindset. Kids can grow in any way they want if they believe it and work for it- and the Daily 5 helps them see that opportunity for growth in themselves. I wrote in our chapter two post about how the steps to independence really made a difference for one of my impulsive, unusually active students. In chapter 3, they gave us a word for those kids- “barometer kids”- the ones who run out of stamina first and give you an idea of when the rest of the class will struggle. I am a firm believer that these steps to independence will make the difference for your kids- especially your barometer kids- for any behavior you want to teach. This chapter’s book study is being hosted by my good friend Whitney at The CraZy Schoolteacher- pop on over to see others’ takeaways! Thanks for reading! I am LOVING this book study with Primary Inspired!